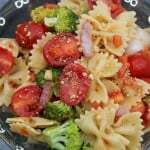 his Garden-Fresh Pasta Salad recipe uses fresh but common ingredients, and total ease in making it. Plus, I just cannot get enough cherry tomatoes right now! Cook pasta in large saucepan as directed on package, omitting salt and adding broccoli to the boiling water the last 3 min. Drain; rinse with cold water. Place in large bowl. Add all remaining ingredients except cheese; mix lightly. Refrigerate 1 hour. Stir gently before serving; top with cheese. SPECIAL EXTRA ~ For added flavour, sprinkle salad with Oscar Mayer Real Bacon Bits just before serving. SUBSTITUTE ~ Substitute 1-inch asparagus pieces for the broccoli florets.